Their labor bore fruit today when Stunlock completely updated the Battlerite website with the game’s true identity. 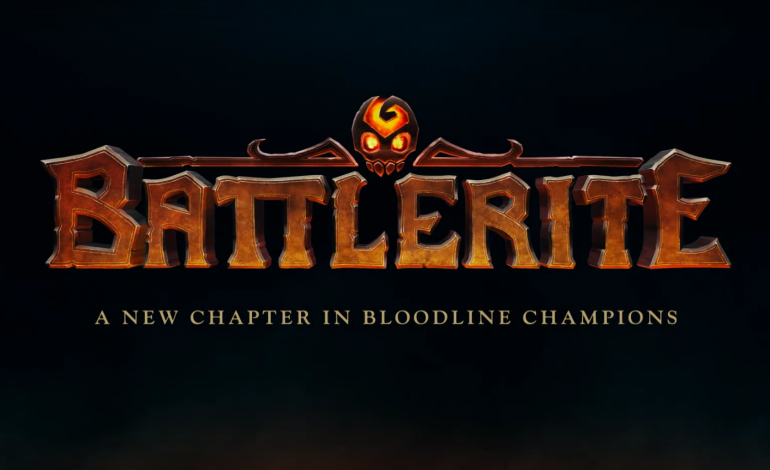 Judging from the game’s subtitle (shown above), Battlerite seems to be the direct successor to Stunlock’s first free-to-play arena brawler, Bloodline Champions, and appears to represent the studio’s return to full form. Quite literally, too. According to Stunlock, Battlerite follows BLC’s vision of stripping conventional MOBA and RPG elements – like farming, itemization, and map objectives – to deliver high-intensity, team-based combat more akin to a fighting game or a shooter than to the aforementioned genres. Battlerite is a TEAM ARENA BRAWLER focused on adrenaline-fueled player vs player combat. Short and intense matches, stripped from random elements to optimize the action. Become part of the rite in a battle of reaction. This is vicious “gladiatorial” fighting at its best. Four familiar faces from BLC also make their return, though their titles are names rather than adjectives now: Shifu (Spear Master), Croak (Ranid Assassin), Freya (Ravener), and Ashka (Igniter). As can be seen on the game’s official page, each characters’ toolkits retains BLC’s knack for weaving together a variety of subsystems to create rich and diverse playing styles. The toolkits themselves have been reworked, however; Igniter’s defensive skill, mapped to R, is absent from Ashka’s kit. The F key (formerly reserved for Ultimates) has been removed entirely, though Ultimates themselves are still present. So far, the only arena revealed so far is one titled Trials of Mount Araz. Judging by the empty slots underneath the Araz name, and those next to the four revealed characters, we can expect to see more news in these departments in the weeks to come. No gameplay for Battlerite has been shown, but footage from Bloodline Champions should be able to acquaint newcomers with Stunlock’s particular brand of gladitorial combat. Upon Battlerite’s reveal, its previously sparse Twitter feed soon became flooded with the jubilations of excited BLC fans. Reddit’s gaming corners are abuzz with the news as well. The absence of Norwegian publisher Funcom in any of the Battlerite announcements has given fans new hope as well; many players attribute Funcom’s poor management of BLC to the game’s decline over the years. Stunlock Studios hasn’t yet announced a release date for Battlerite, but those interested in signing up for the closed beta can do so on its official website.